Personalised to taste, Our Custom Lanyard with Usb Memory can be customised with colour, the rotary print inself and even the memory size inside the flash clip unit. We love flash drives at calendar lady, fast at USB 2.0 compliant standards and reliable to store documents or various types, they have become the swiss army knive in shifting data to and from systems, laptops, computers and even the PS3 and XBOX 360 consoles. Branded with your corporate brand name and company logo, they help signify your brand and message you wish to convey. 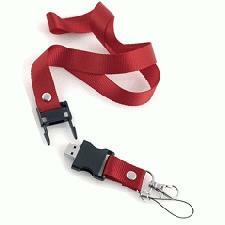 Lanyards of this type still have the function of clipping practically anything to its clip, including mobile phones, VIP, and identification cards and even whistles. Choose you preferred memory size up to a huge 32gigabyte! Our 2019 Olympic Gifts are perfect to give to customers to help expose your corporate brand name during the spectacular London Olympic 2019 events! !